In June 17, 1864, Governor-General Mr. L. A. J. W. Baron Sloet van Beele broke ground for the first railway line in Java, which was then part of Netherlands East Indies. The line belonged to the Nederlandsch-Indische Spoorweg Maatschappij (Netherlands East Indies Railway Company), and the first line in operation was between Semarang and Tanggung, opened in August 10, 1867. The line was then unprofitable, so the company turned to the government for help in completing the rest of the 166 km long main line to Yogyakarta through the Vorstenlanden. The great cost involved in the building was partly caused by the decision to build the tracks at the standard gauge (1435 mm/4' 8�"). This also resulted in the selection of a narrower gauge for most of the later construction, after a 1869 report by J. A. Kool and N. H. Henket showed the economy and suitability of 1067 mm (3' 6") gauge. In fact, the law allowed only the construction of 1067 mm gauge railways, except for some 600 mm gauge feeder lines. The first of the narrow gauge line was also built by the NIS, connecting Jakarta (then Batavia) and Bogor (then Buitenzorg). It was opened in January 31, 1873 after two years of construction. The line was quite profitable, but as it was isolated from the rest of the NIS lines in Central and East Java, it was later sold to the SS in 1913. The state then began to get involved directly in the construction of railways, after a rather lengthy period of hesitation, since the Liberal government in the Netherlands would rather have private enterprise creating the railways. Anyway, state railways were considered necessary for strategic purposes. In May 16, 1878 the first line of the Staatsspoor- en Tramwegen in Nederlandsch-Indië (State Railway) was opened between Surabaya and Pasuruan. Three years later, construction was begun on a line from Bogor to Cicurug in West Java, with the intention to reach Cilacap, an important port in the southern coast of Java. In 1884, the SS lines from the east reached Surakarta, on the NIS main line, and in 1888, the western line reached Cilacap. A continuous railway line was in place between Jakarta and Surabaya in 1894, with the completion of the last section, between Maos and Cibatu. The journey between the two points took three days, with the actual travel time being 32� hours, because trains did not run at night, and the presence of different gauges required passengers and goods to be transferred at both Yogyakarta and Surakarta. Yet it was a great improvement over the horse-hauled carriages, which took up to two weeks for the trip. The Samarang-Joana Stoomtram Maatschappij received the concession to build a light railway ("tramway") between Semarang and Juwana in 1881. It was the first of the 15 tramway companies in Java. The tramways were usually related to agricultural developments, especially sugar plantations and factories, tobacco and rubber plantations, and forestry. The lines also acted as feeder to the main lines. These tramways were built according to certain standards, allowing some exchange of rolling stock with the state railways, and some lines were indeed later upgraded to main-line railway standards. Sumatra had its first railway by 1876, a 4 km line between the port of Ule Lhee and Banda Aceh (then Koetaradja), built for military purposes. This line used the 1067 mm gauge. As the Aceh War raged on, the lines were expanded (and suffered from sabotage attempts) along with the Dutch military advances. The first line of economic significance in Sumatra was laid by the Deli Spoorweg Maatschappij in 1886, between Labuhan (the erstwhile port) and Medan. This line served the fertile Deli region, and later served Besitang, Tanjungbalai, Rantau Prapat and Pematang Siantar. The last section of the line to Rantau Prapat was completed in 1937. The Aceh line was later regauged to 750 mm (2' 5�"), and was completed to Besitang, 520 km southeast of Banda Aceh, in 1917, where a junction was made with the DSM line from Medan. The Atjeh Staatsstoomtram was transferred from the military to the SS in January 1, 1916. Even then, the situation in Aceh was not exactly peaceful, and the line kept its military importance up to the end of Dutch rule � even into independence days! The government constructed a line in the Minangkabau region in West Sumatra between 1891 and 1894, between Teluk Bayur and the coal mine at Sawah Lunto. The 158 km-long line had to clear the Bukit Barisan range, climbing up to 773 m, and requiring a 43 km-long rack section between Kayutanam and Batu Tabal. It was the only rack line of a significant length in Indonesia. The line also went to Bukittinggi (then Fort de Kock) and Payakumbuh, both relatively important regional centers. In the southern part of Sumatra, the government constructed a railway line from Panjang (then Oosthaven, the ferry port for Java) to Kertapati (across the River Musi from Palembang), and to Lubuklinggau, serving also the coal mine at Tanjung Enim. The construction began in 1914 and was completed in 1932. The only public railway in Indonesia outside Java, Madura and Sumatra was opened in July 1922 in South Celebes. The line went from Ujung Pandang to Takalar, a distance of 47 km. It was closed in 1930 due to lack of traffic. The railway service improved gradually. By 1899, a third rail was installed on the standard gauge line between Yogyakarta and Surakarta, although through passenger trains only began operating in February 1, 1905. The opening of the new line through the Priangan mountains in May 2, 1906 allowed the introduction of a much faster passenger service between Jakarta and Surabaya, requiring only 23 hours of travel time, but the actual journey still took two days. In December 31, 1912, the law allowing the construction of the Cirebon-Kroya line was passed. The First World War stagnated the construction, but it was completed and opened in January 1, 1917. This line allowed trains to avoid the long, heavily graded (2.5%) original line through Bandung, and shortened the distance between Jakarta and Surabaya by 44 km. In 1918, the banning of running trains at night was lifted. The passenger train from Jakarta to Surabaya then took 17 hours. The Semarang-Cheribon Stoomtram Maatschappij, a tramway stretching along the north Central Java coast, was an important one: it served 27 sugar mills. Beginning in 1914, its main line was improved to higher standards, allowing greater speeds and heavier trains. It became a significant partner to the SS in the Jakarta-Semarang passenger trains. The fiftieth anniversary of the SS in 1925 was marked by the inauguration of an electric line connecting Bogor to Jakarta and its suburbs. The electrification was at 1500 volts DC. In May 1, 1929, a 1067 mm line was completed between Yogyakarta and Surakarta, finally allowing much faster schedules between Jakarta and Surabaya. The best time was cut to 13� hours, and then gradually to 11 hours and 27 minutes, in 1939. The train, Eendaagsche-Expres, had an average speed of 71.7 km/h on the Surabaya-Jakarta run. 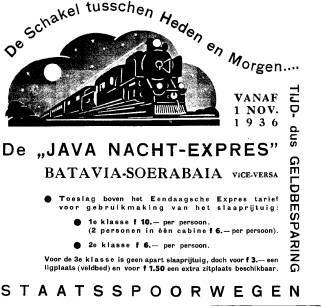 Later, in November 1, 1936, another express service was introduced: the Nacht-Expres (Night Express). It was slower (between 21.00 and 05.00, the speed was limited to 60 km/h) than its daytime counterpart, but was more comfortable, for the passengers would not be affected by the tropical sun heat. The Great Depression came in 1929, and the economic difficulties that resulted caused the cancellation of several projected extensions, for example, a railway line connecting the Southern and Western Sumatran SS lines to the DSM line, a line in West Borneo from Pontianak to Ketapang, and another in South Borneo, and a line in North Celebes. A number of unprofitable lines were closed, including the Tulungagung-Tugu and Jatibarang-Karangampel lines (both closed in 1932), Warungdowo-Purwosari and Warungdowo-Ngempit lines (1933), Tanahmerah-Kebanyar (1936) and Pamekasan-Kalianget (1937). Plans to renew the locomotives of the railways were also affected. In 1931, only the SJS bought new locomotives, which became the last order by any of the Indonesian railways until after the Second World War. The SS, facing competition from autobuses and aeroplanes, but unable to buy new locomotives, rebuilt many freight locomotives, enabling them to run at higher speeds, resulting in faster schedules. Generally, on the SS in the 1930s, passenger train speeds and frequencies were raised. As an example, the Jakarta-Bandung expresses numbered only two in 1934, taking 3 hours and 40 minutes. In November 1, 1934, the frequency was doubled, and the timing became 2 hours and 45 minutes, later to be cut down further to 2 hours and 30 minutes. The trains were commonly known as the Vlugge Vier (The Four Fast [Trains]). Compare to present-day Jakarta-Bandung schedules. Not only on the SS in Java, but also in South Sumatra there was an increase in speed limits, allowing a maximum of 75 km/h on the South Sumatran main line (in 1940), and also 50 km/h on some lines in West Sumatra. It was also in this period that the SCS upgraded its line to a maximum of 75 km/h, resulting in faster express schedules between Jakarta and Semarang. It might be interesting to note that the fastest speed in the SS days was not reached by a 1000 class 4-cylinder compound, but instead by an older 700 class. In fact, the 1000 class (�duizendjes�) was considered a failure, and had the Depression not intervened, the class would have been rebuilt into 2-cylinder simples. The Second World War broke out in September 1939, affecting the railways once again. NIS' plans to obtain several diesel-electric railcars from Beijnes and high speed streamlined standard gauge steam locomotives from Werkspoor were cancelled, because The Netherlands was occupied by Germany. For strategic purposes, the NIS standard gauge line from Solo to Gundih was fitted with a third rail, allowing narrow gauge trains to travel from Semarang to Solo via Gambringan. Japan invaded Netherlands East Indies in 1942, and occupied it, taking two weeks to do so. The occupation resulted in the unification of all railways in Java under the military administration, known as Rikuyu Kyoku. The system was then handed over to a Japanese civilian administration, but were later administered by the military again in the latter part of the war. The Sumatran lines were similarly administered by the military occupiers, geographically separated into three systems: Kita Sumatora Tetsudo (North Sumatra including Aceh), Seibu Sumatora Tetsudo (West Sumatra) and Nanbu Sumatora Tetsudo (South Sumatra). Under Japanese occupation, further lines were pulled up, including the whole standard gauge line, which was regauged to 1067 mm. In March 1943 the last standard gauge line was converted, leaving only one small standard gauge harbor line in Semarang. Many less important tramways were removed. A number of rolling stock were sent to other Japanese-occupied territories (Manchuria, Burma, Malaya, Siam and Indochina). Although none of the standard-gauge locomotives were taken elsewhere (many survived rusting in Yogyakarta works to the 1970�s), almost 40 1067 mm gauge locomotives were sent abroad. Of these, some of the former NIS 381-400 series (renumbered into the C52 class) were returned later, but were scrapped immediately as they have been regauged to metre gauge. It was during the Japanese occupation that the worst railway incident in Indonesia occurred. On Christmas Day 1944, 200 were killed and 250 were injured when a train lost its brakes and ran away in the Anai valley in West Sumatra. Many prisoners of war and impressed locals (commonly known as romushas) were forced to build new lines in Japanese-occupied territories, those in Indonesia being the Saketi-Bayah (in Banten, West Java) and Muaro-Pakanbaru (in Sumatra) lines. The latter line was only completed when the Japanese almost capitulated, and was therefore never used. The locomotives, many of which were already old and worn out, were further worn due to lack of maintenance and spare parts. Many romushas and railway employees were sent abroad to �help� the railway operations in Siam and Burma, and the majority never returned. Indonesia declared independence in August 17, 1945, and in September 28, 1945, the Japanese railway administration was forced to hand over the railway to Indonesian freedom fighters, a day celebrated as Hari Kereta Api. The railway lines in Java was administered as Djawatan Kereta Api Repoeblik Indonesia, and those in South and West Sumatra Kereta Api Negara Repoeblik Indonesia. In North Sumatra it was Kereta Api Soematera Oetara Negara Repoeblik Indonesia. When the Dutch returned to Indonesia, they created the Staatsspoorwegen/Verenigd Spoorwegbedrijf (SS/VS) as a temporary administration, starting on January 1, 1946. It managed all public railway lines in Java, except the Jakarta tramway lines, and lines in South and West Sumatra. Many battles between Indonesian freedom fighters and Dutch soldiers occurred over the railway, in fact, the lines often became the demarcation line between Dutch-held and Republic-held areas. The railway and railway workers did many heroic acts. In February 3, 1946, a special train including two inspection cars (saloons) evacuated President Soekarno, Vice President Mohammad Hatta and their entourage from Jakarta, which was becoming unsafe, to Yogyakarta. Trains were also used to smuggle firearms and transport freedom fighters. On the other hand, the Dutch also used trains to transport prisoners of war in atrocious conditions, sometimes resulting in fatalities, such as the incident on November 23, 1947, in which 46 of 100 prisoners were killed when they were pressed into three closed goods cars and transported without food or drink for 13 hours. While the struggle raged on, the railway service was kept. Passenger trains were ran between significant cities and towns of the Republic (Cisurupan, the HQ of the DKARI; Yogyakarta, capital of the republic; Malang and others), and some of the lines removed by the Japanese were restored, such as between Kutoarjo and Purworejo. The SS/VS also did the same, running trains in the Dutch zone of control. As the War for Independence raged on, most railway lines were controlled by the Dutch. The SS/VS did cooperate with the DKARI on the Jakarta-Tangerang line and several other lines, but in general, there was an atmosphere of war. Sabotages on VS lines were almost daily occurrence. After Indonesia's full independence in 1950, the railway was at an appalling state. Ten years of neglect and war has resulted in destruction or damage to the rolling stock, trackage and other structures. The railway was rebuilt: 100 general purpose steam locomotives were ordered, tracks torn up during the troubles were relaid, new structures were built replacing those destroyed in the "scorched-earth" moves in the war, and new rolling stock were ordered. The D52 class was actually ordered by the SS/VS, but was delivered to the Indonesian DKA. It might be noted that the former railway and tramway companies retain their paper existence, some up to the 1970s. The DKA owned the assets of the former SS, but had to pay for the use of the private railway�s assets. The early-independence years were not without its share of troubles. Rebellions flared up in several areas, and the railway was inevitably affected. As an example, DI/TII rebels in West Java sometimes mined trains or loosened track spikes, causing derailments, sometimes with loss of life, such as when train no. 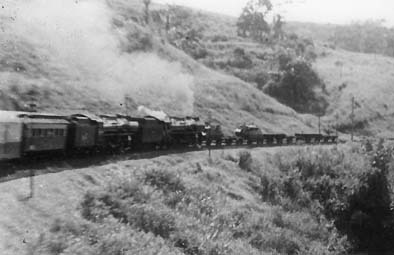 8306 was attacked between Warungbandrek and Malangbong in February 2, 1953. Other examples were when Cangkring station, near Cirebon, was burned down in August 23, 1951. Trains passing through rebel-infested areas were piloted by an armoured car, and the train itself was to push an armoured car and several flatcars weighed with tracks, to detonate any present mines (so the mines did not damage the train). The armoured car itself was a relic of the War of Independence, built by the Dutch for the same purposes. The 1950s and 1960s were "survival years" in the words of the Indonesian Railway's official historian. The railway required subsidies to keep operations, many lines could not be run at a profit, obtaining sufficient spare parts for locomotives was a major problem and condition of the trackage was deplorable. But those years were not totally wasted. Dieselisation came in 1953, in the form of 27 Co-2-Co locomotives from the United States, and between 1957-1967, around 250 diesel locomotives went into service, displacing steam from most main line and long distance passenger trains. New passenger stock were also introduced in the same period, although these were limited for main line trains, and older equipment remained in use for the lesser trains. New vacuum brake-equipped freight wagons were also obtained, for the overnight fast freight service between Jakarta and Surabaya. In 1963, all public railways in Indonesia were unified under a new administration, Perusahaan Negara Kereta Api. Previously, the Deli system in North Sumatra was separately administered after its nationalization in 1958. Further administrational changes occurred in 1973, when the PNKA was renamed PJKA (Perusahaan Jawatan Kereta Api). The "survival years" saw the railway service generally worsening. The political turmoil in Indonesia in the mid-1960�s resulted in serious problems, as many railway workers were members of the communist-affiliated union, and were purged in the aftermath of the failed coup d�etat. There was also the aphocryphal tale of railway workers sawing off the driving rods of a West German-built diesel, for being Western. However, this might be an urban legend. In the early 1970s, however, efforts were made to increase the speed of the prestigious Jakarta-Bandung expresses, back to 2 hours and 30 minutes, as it was in the late 1930s, from more than 3 hours. It succeeded, but the high track maintenance costs caused the speed to be reduced again. Also in the 1970s, ex-tramway lines began to be abandoned, as they were no longer economically viable: not enough paying passengers (trains were always loaded to capacity and more, though). The victims included the whole Aceh and Madura systems and most branch lines in Java. Presently, the Purwosari-Wonogiri line (ex-NIS) is the only proper tramway (it runs through the city center alongside the main street) still in operation. All other tramway lines have been removed. As the lines were removed, the steam locomotives serving on those lines were also retired, a process completed by the mid-1980s. Or perhaps, it was the run-down of the rolling stock which resulted in the abandonment of the railway lines. Even in the early 1970s, many steam locomotives were already disused. The governor of Central Java, Soepardjo Roestam, promoted a locomotive museum in Ambarawa, in the station area. Later on, as all steam locomotives were retired, many remaining steam locomotive were preserved in another museum in Jakarta. Many others were also preserved individually elsewhere. More than sixty steam locomotives are preserved now. The dieselisation and abandonment of most unprofitable lines improved PJKA's financial position, but it continued to require subsidies from the government. Also, it did not try creating new sources of income, the most obvious being the lack of launching of new trains. In 1991, PJKA was reformed into Perumka (Perusahaan Umum Kereta Api). It was intended that the Perumka would begin to cover its costs, by "cross-subsidy": launching new, comfortable and fast trains with higher fares to subsidize the low fares of economy class trains, whose fares cover only 70% of the running costs. The new management, led by Soemino Ekosapoetro, was successful. In 1994, Perumka made profits of about 3.88 billion rupiahs (then about 8 million US dollars), the first ever profit that a post-independence Indonesian railway made. In 1997, Perumka's profits reached 23.2 billion rupiahs. In August 10, 1995, after several years of upgrading track to enable higher speeds, coinciding with the Golden Jubilee of Indonesia's independence, the Perumka launched the first two of the Argo trains. These trains were extra-fare, all executive class, high speed passenger trains. These trains do not only bring great profits to the railway, but also create a new image: previously, trains were thought as "dirty, slow, uncomfortable" mode of transportation, unsuitable to the growing middle-class in the Indonesian society. In Java, passenger trains were much more important than freight trains. But in South Sumatra, the Bukit Asam coal mine in Tanjung Enim is an important customer of railway services: to haul the mined coal to the port of Tarahan. In West Sumatra, the Ombilin coal mine also uses the railway's service to carry coal to the Indarung cement factory in Padang. The economic crisis which hit Indonesia in mid-1997 was somewhat comparable to the Great Depression in 1939: It resulted in both difficulties and opportunities. The fall of the rupiah against the US dollar resulted in the reduction of new locomotive orders, reduction of profits and increased maintenance expenses. Express passenger speeds were reduced again, although the reduction was insignificant. The opportunity came in the form of increasing demand for passenger trains: airplane fares, calculated in US dollars, became too expensive, and the customers, especially the middle class, who have always used airplanes, began to look at trains as an alternative. 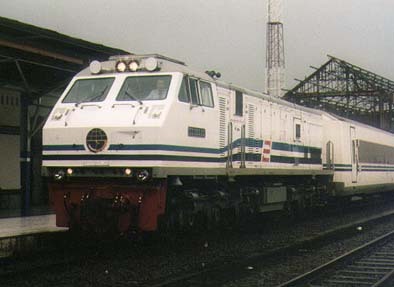 The Perumka responded by launching new passenger trains, many of them executive class-only or executive and business class trains, such as the Dwipangga, Mahesa and Sancaka. Perumka's management was further reformed in June 1, 1999, when it was renamed PT (Persero) Kereta Api Indonesia. However, in the recent years the Indonesian Railway has faced tough challenges. The continuing economic crisis has resulted in a severe maintenance backlog for the rolling stock and trackwork, and many trains were running in less-than-top condition, or not running at all. In the recent years the Indonesian Railway has faced tough challenges. The railway's safety record in the last years is not one to be proud of, its passengers, especially commuters, demand greater comfort and reliability, and the economic constraints has only made the situation more difficult. However, the Indonesian Railway has succeeded to survive, and is certain to prosper at a future time.